Plant Cyclamen about three centimetres deep. Place the corm slanting in the planting hole so that water can easily drain off. 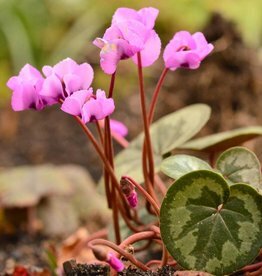 Cyclamen prefer a chalky, loamy soil that is well-drained. When planting always improve the soil by mixing in some leafmould or compost, as well as clay minerals. Give Cyclamens a yearly dose of lime.